What Are Tenants Improvements and Betterments? Many business owners make upgrades to buildings they rent from a landlord. In commercial property insurance, these upgrades are called tenants improvements and betterments or TIBs. Tenants improvements and betterments are paid for by the tenant but become part of the building. Unless a contract states otherwise, the landlord generally obtains ownership of the upgrades once they have been installed. The tenant maintains an insurable interest in the use of the improvements. The tenant's interest in the property ceases when the lease terminates and the tenant moves out. The following example demonstrates some improvements a tenant might make. Larry owns Luxury Leathers, a leather goods shop located in a strip mall. Larry operates his business out of retail space he rents from the mall owner, Shopping Centers Inc. Larry has made various improvements to his rental space since Luxury Leathers moved into it two years ago. These include new recessed lighting, new carpeting and a small office Larry constructed behind the retail area. The lease between Larry and his landlord states that any improvements Larry makes to the building during the term of the lease become the property of the landlord at the time they are installed. Completed TIBs are to be insured by the landlord. Shopping Centers Inc. has insured the building under a commercial property policy. The policy automatically covers any improvements to the building that are made during the policy period. Larry knows that any TIBs he installs will become the property of his landlord. Nevertheless, Larry will have the use of those improvements for the remainder of his lease. Larry could lose his use interest in the property if the TIBs are damaged or destroyed by a fire or other peril. Fortunately, Larry can insure his interest in the improvements under a commercial property policy. Many commercial property policies define tenants improvements and betterments as fixtures, alterations, installations or additions to a building you occupy but don't own. That is, TIBs are items you have purchased or installed at your expense but cannot legally remove. Examples of TIBs are the office, lights, and carpeting Larry has installed in his store. This property is now part of the building. Because Larry doesn't own it, he can't take it with him if he moves to another location. If Larry attempted to remove the property, he could damage the building. TIBs may be insured by the tenant or the landlord. The lease should clearly state which party is responsible for providing insurance. Otherwise, disputes can arise over whose insurance, the landlord's or the tenant's, should apply to losses involving damaged TIBs. The lease should also specify when ownership of TIBs passes from the tenant to the landlord. This often (but not always) occurs when the improvements are installed in the building. 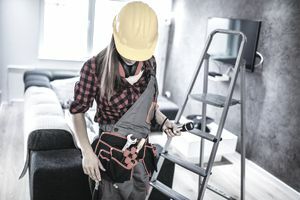 Since TIBs are owned by the landlord, they are often insured in conjunction with the building under the landlord's commercial property policy. Policies typically cover the building scheduled in the policy, completed additions, and fixtures (meaning property permanently attached to the building). An example of a fixture is a chandelier installed in the ceiling of a restaurant. Suppose that the lease between Luxury Leathers and Shopping Centers Inc. requires the landlord to insure TIBs. If Shopping Centers Inc is insured under a typical property policy, the office, carpeting, and recessed lights Larry has installed should qualify as covered property. Improvements made by a tenant increase the value of the landlord's building. If a tenant spends $15,000 on TIBs, the value of the building will increase by $15,000. The building limit on the landlord's policy should be increased by the value of the TIBs. Otherwise, the building may be underinsured. If a loss occurs and the landlord has failed to purchase adequate limits, the landlord may incur a coinsurance penalty. If the lease requires the landlord to repair or replace damaged TIBs, then the tenant need not insure these items. Otherwise, TIBs should be insured under the tenant's property policy. Most commercial property policies automatically cover, as business personal property, a tenant's use interest in TIBs. Your insurer will not pay anything if your landlord repairs or replaces the damaged improvements. While tenants cannot tear out TIBs they installed, they can remove a category of property called trade fixtures. Trade fixtures are items installed by the tenant that the tenant expects to remove when he or she vacates the building. They are essential to the tenant's business and can be removed without damaging the building. Trade fixtures remain the property of the tenant, so the latter is responsible for insuring them. Suppose that Larry installs new cabinets in his store for displaying his leather goods. Both Larry and his landlord expect that Larry will take the cases with him when he moves to another location. Even though the cases are attached to the building, they are considered trade fixtures rather than TIBs. Other examples of trade fixtures are computers, vending machines, and machine shop equipment. Tenants should ensure that the lease clearly specifies what types of property qualify as trade fixtures. Otherwise, the landlord may refuse to allow the tenant to remove certain property when the lease expires.